How do I associate mp3 with Google Play? When I tap on an mp3 in File Manager (KitKat) it opens in a little white window within File Manager. If I go to settings\apps and try to clear the association, it says there are no defaults. How do I make the mp3s open in Google Play? Can you long press the file and generate a pop up that asks how you want to open the file? Or even in the settings of your file manager there should be a place to set defaults. Long press does not give that option, and I can't find a setting in File Manager, but thanks for trying. I tried to delete all file associations by going to settings\apps\Reset Default Apps but tapping the song in File Manager still doesn't let me select a default app, it just plays in its little white window. Maybe I can't make it do what I want. Welcome to the forums. I am inclined to think that Play Music only can play what you have uploaded to them. If you have a music file that you loaded to the phone, I don't think Play Music can play that. There are music players that can do that; PowerAmp is a good one ($4 in Play with a free one that has a trial period). 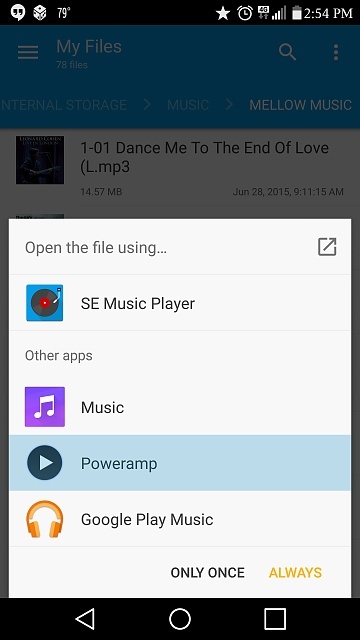 I can play locally stored mp3 files from Google Play, I just can't make Google Play open the mp3 from File Manager. Thanks. Sorry I didn't think to do this before; I tried doing what you would like to do with Solid Explorer. Play Music is an option from that. So perhaps it is the file exploring app? Tell me, when Solid Explorer gives you the option to choose an app, does it have a choose as default checkbox? Sorry I left you hanging. After installing Solid Explorer and another music player, I've discovered that the little white window playing music in File Manager is Google Play. Unfortunately, it won't keep playing when I switch to any other screen, and it's got no features to speak of. So I either have to open songs from within Google Play, or find another player. Thank you so much for taking the time to help me. You are welcome. As for another Player, I really like PowerAmp for playing music files locally. Sure, it's a paid app; only $4. But the best $4 I ever spent on an app. There is a free version that is a trial basis, for at least a week as I recall. How do I delete the e mail number when there are no emails? My phone's display is stuck in negative how do I change this? Why does my friend's profile picture on Facebook Messenger show him chatting with himself? How do I make a group send sms to all or few of the group with my Nexus 5?